When most people hear the word pirate their thoughts may understandably turn toward the stereotypical Hollywood meme of men roaming the high seas in sailing vessels seeking adventure and plunder. The image of the prototypical pirate with his sword, eye patch and pistol attacking under the skull and cross bones flag of the Jolly Roger may be loosely based on the seventieth century variation of those typically engaged in crimes at sea but that is only the smallest sliver of the historical scope of piracy, for millennia men have engaged in commerce dependent on sea faring ships for transport. Once men took to the seas with valuable others would follow with larcenous intent. Just because we live in the high tech world of the twentieth century does not mean the pirate as a real threat is extinct. Albeit, the overly romantic elements shown in the swashbuckling films of the thirties may be long gone, if they ever actually existed but pirates continue to travel the commercial waterways seeking victims to highjack and plunder. This resurgence of the pirate as a sea going menace is very real and more unscrupulous than ever. The film ‘Captain Phillips’ recounts the story of a man forced to put his life on the line by facing invading pirates that have no qualms to preclude cold blooded murder. As is the case with most movies there are issues as to its veracity. Some claiming firsthand knowledge of the incident sites major departures from the truth the filmmaker stands behind the authenticity in relating the essence of the story; the captain of the attacked vessel brought the crew through the ordeal alive with his cargo intact. Once again I have to advise those concerned with the historical details to broaden their scope and consider other accounts pf the events. One thing that is true; this is a gripping film that excels in the quality employed to relate an incredibly entertaining movie. The MV Maersk Alabama is a container ship originating from the Port of Salalah in Oman. In command of the vessel is Richard Phillips (Tom Hanks), who has orders to take the ship through the Gulf of Aden to Mombasa, round the Horn of Africa. Aware that there has been confirmed reports of pirate activity he proceeded with heighten awareness. A prudent part of his precautions was to put his crew through regular drills to ensure everyone knows precisely what to do in the event of a pirate attack. During one of these practice session the dreaded incursion occurs. A pair of small crafts begins to pursue the unarmed cargo ship; they were manned by a group of Somali pirate’s intent of boarding her. Captain Phillips manages to evade them initially having one of the skiffs breaking off in response to Philip’s buff of calling for military intercession. Rough seas are easily managed by the larger ship but the remaining pirate ship is forced to abandon its chase. The respite from danger is short lived when one of the pirate skiffs returns the next day manned by four heavily armed men commanded by Abduwali Muse (Barkhad Abdi). Using a crudely crafted but eminently effective ladder the felonious group boards the Maersk Alabama and takes it over. Phillips cuts the power on board and orders his crew to secure themselves in the most defendable area of the ship, the engine room. Phillips attempts to assuage the pirate leader offering the contents of their safe, approximately $30,000. Muse is under orders from his superiors for a far greater prize to be obtained by ransoming the cargo and crew for the millions in insurance. Down below a member of the crew succeeds in cutting the emergency power plunging the ship into darkness. Muse reacts by searching the engine room only to be captured by the crew. One of the pirates negotiates a trade; Muse for Phillips and access to one of the ship’s emergency boats. Phillips is forced into the lifeboat along with his captors. Back onboard the Maersk Alabama the situation rapidly deteriorates as the pirates run out of a stimulant they have been using to remain alert. Losing contact with their mother ship the pirate’s desperation mounts culminating with being intercepted by a U.S. destroyer. Other American ships arrive on the scene trying to negotiate Muse, but he refuses to consider a peaceful resolution. The captain of one of the American ships is under orders to prevent the pirates from reaching landfall by any means necessary. That night Phillips attempts to swim to safety but when fired upon by the pirates are forced to return to the lifeboat. Meanwhile a team of navy SEALs move into position to regain control of the situation prepared to use deadly force if necessary. Although overlooked by the Academy awards Tom Hanks garnered well-deserved accolades for his performance here. Despite that unwarranted snub Mr. Hanks gives one of the most intensely emotional roles in his exceptional career. Hanks in undeniably one of the most versatile actors of our time mastering roles ranging from light comedy to penetrating psychological explorations of a reasonable man thrust in to circumstance devoid of any reasonable action. This man has a remarkable range at his command that stems from his well-known affable personality. The consummate professional it is obvious that his ability to get along with the crew and his cast mates translate to his affecting a synergy that bolsters the entire production. The director, Paul Greengrass, has a unique resume that made him the ideal filmmaker to helm this movie. Much of his experience is in directing fictional action oriented thrillers like ‘The Bourne Supremacy’ and ‘The Bourne Ultimatum’. This is reinforced by his dramatizations of historically significant events in ‘Bloody Sunday’ and ‘United 93’. This combination of films provided Mr. Greengrass with the requisite experience in crafting a mesmerizing thriller while maintain the respect for the real people involved with the ordeals. 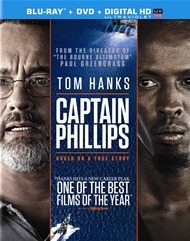 The screenwriter, Billy Ray, based his script on the novelized account of Captain Richard Phillips. Previously his credits included thrillers such as ‘Flightplan’ and notably the migration to the screen of the widely popular novel, ‘The Hunger Games’ making him a highly sought after author. This is a film that reaches out to grab your attention immediately retaining it completely through every frame of the movie. It is rare that such an emotionally charged topic is undertaken on film as entirely successful as this one making it not only incredibly entertaining but an important piece of cinema.